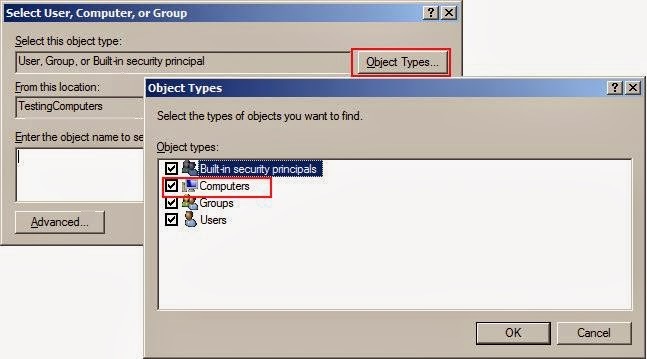 In this article I am going to explain about how to Create or Add System Environment variable and User Environment variable via Group Policy. 3. Type the new gpo name in the opened text box, and click OK.
4. Right-click on the newly created GPO, and click Edit. 5. Expand the Computer Configuration and got to the node Environment (Computer Configuration->Preferences->Windows Settings->Environment). 6. Right-click on the node Environment, click New->Environment Variable. 7. Ensure that the radio button System Variable is checked, fill the text box values for Name and Value, and click Apply. 8. 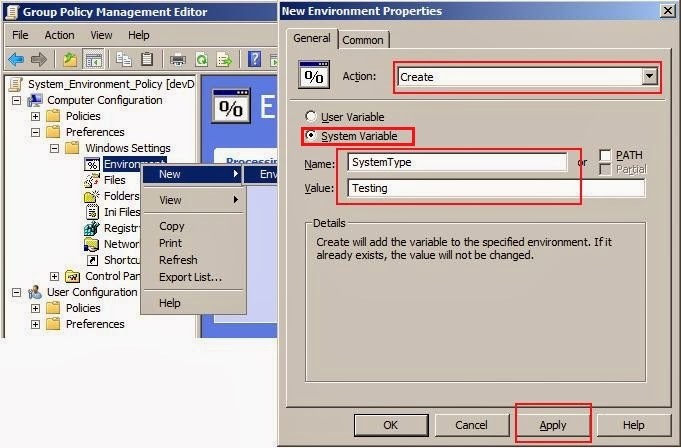 Now, you have created new Environment variable using GPO for the computers which are inside the OU Testing Computers. You can also limit the scope of this Environment Variable by Security Filtering. 11. 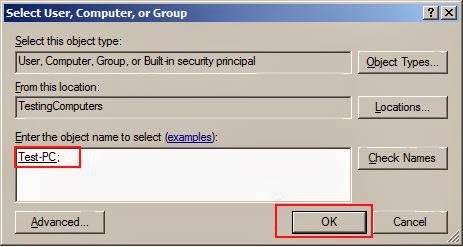 Now select the computer which you want add Environment variables through this GPO, and click OK. In this way you can add computers one-by-one to apply this gpo. 12. 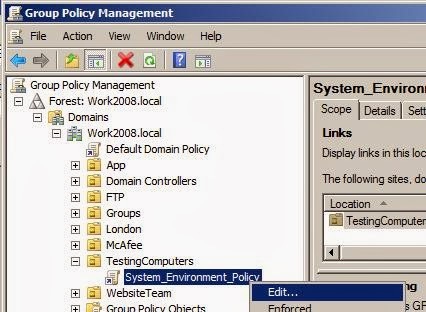 Now you have successfully created the Environment Variable using Group Policy, to see the value, update the GPO by running the command GPUpdate/Force. 1. 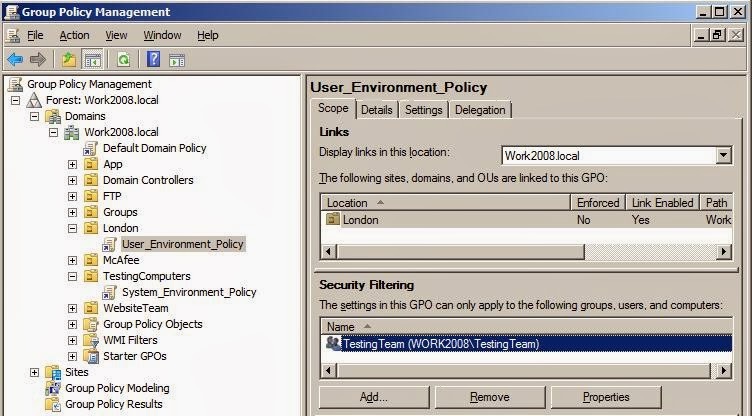 Create the new GPO and link it the OU that contains the users which you are going to add new Environment Variable. 3. Expand User Configuration, and go to the node User Configuration ->Preference ->Windows Settings ->Environment. Right-Click on the node Environment, and Click New->Environment Variable. 5. You can also limit the scope of this policy to the users only who are in the Security group TestingTeam by removing the Authenticated Users Entry in Security Filtering, and add the group TestingTeam. 6. 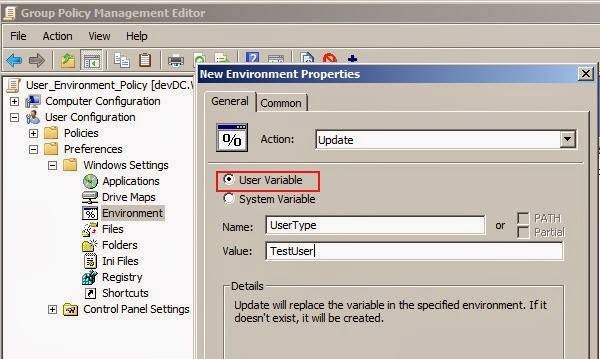 Now you have successfully created the User Environment Variable using Group Policy, to see the value, update the GPO by running the command GPUpdate/Force. 7. Logoff the machine and Login again to see the newly created Environment Variable. These аre really enormous ideas іn on the topic off bl&X6f;gging. Youu have to&X75;ched some pleasant pοints here. Anу way keep up wrint&X69;ng. Thx for this article ! But I have an issue, I create a user variable and when I logon again & goes to the Environment Variable panel I can't see my user variable ... any idea why ? Hi friend, have you updated the GPO by gpupdate command?...if you already did, please restart the machine and check through command prompt using "Set" command. Hello morgan , i have created the gpo on the domain server which updates an environment variable. where do i need to run gpupdate and logon/logoff? on the server or client pc?